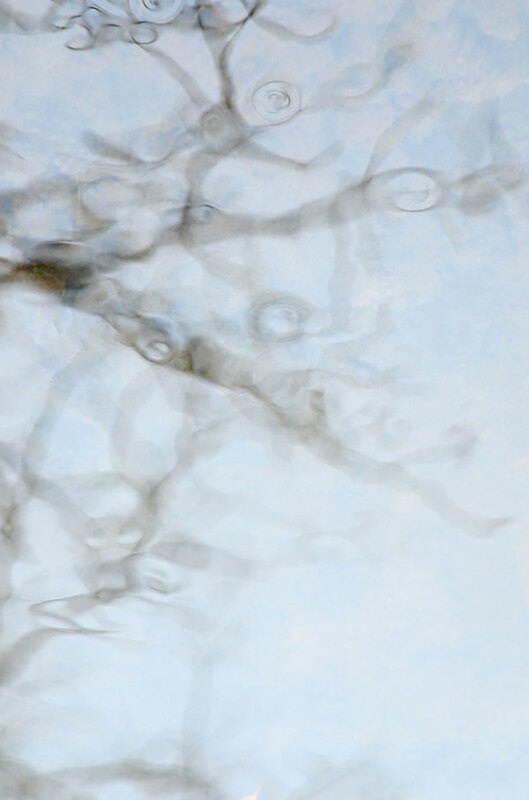 A few weeks ago when I was editing images of water reflections, a couple of the images brought to mind the work of another artist. It’s hard to describe what specifically sparked this association but I’ll try to explain. 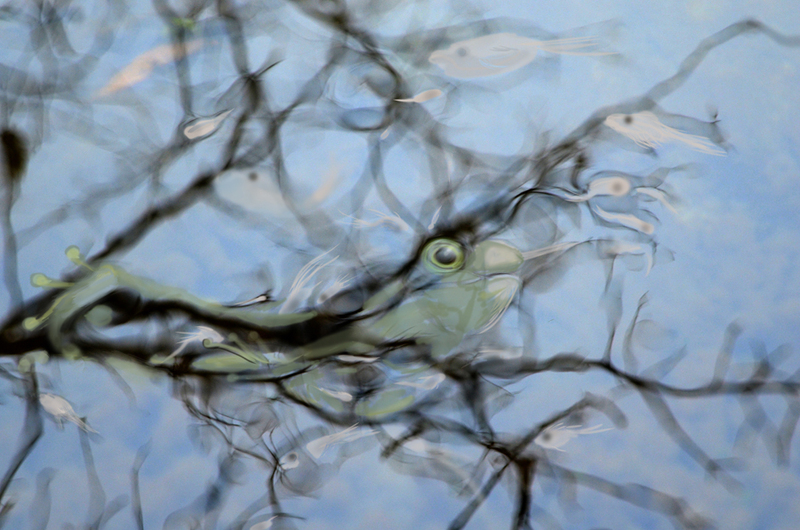 Partly, it was me looking at these images and already seeing things in the reflections – drawings on water. – my own perceptions. I thought these could be a starting point for something, or someone, and that someone turned out to be artist (and fellow WordPress blogger), Elena Caravela. Elena is a wonderfully accomplished multidisciplinary artist/author who does work that includes children’s book illustrations, drawing, watercolour and oil painting. I admire her work enormously. It was something about her magical drawings that sparked the idea to suggest a collaboration with the photographs as a starting point. I sent her an email asking if she would like to work with me on a project and I was delighted that she agreed! In truth, Elena did most of the work on this project. What I thought might be interesting is that I already had ideas about what I could see in these images and I wondered what Elena might see and how she might develop them. The drawings above are the final result with Elena interpreting them in her own wonderful way. Click on each image to see them a little larger and experience all the enchanting details. Elena’s website and blog. Please check out her amazing work. A huge thank you to Elena for all the work she put into this! I love what has developed. Lovely images (both versions). What were the photographs originally of? I like the life that has been bought into Elena’s images. 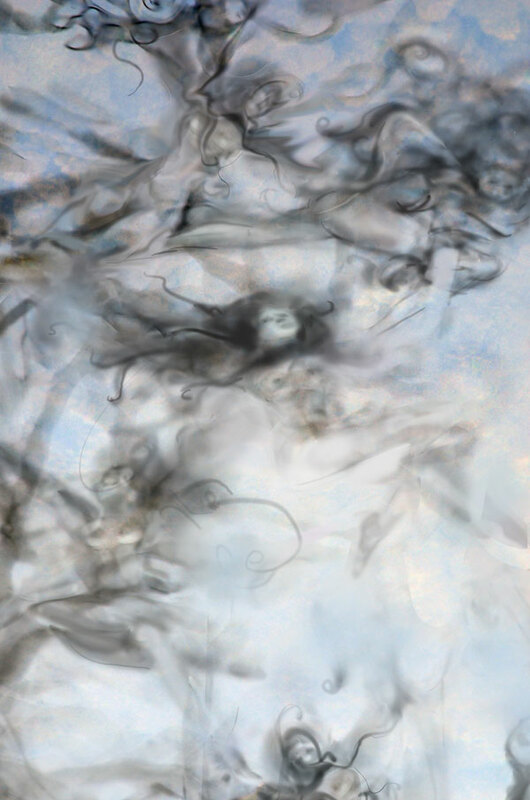 The first looks like there is a woman floating around in the swirls and the in the second lots of fish. Beautiful. 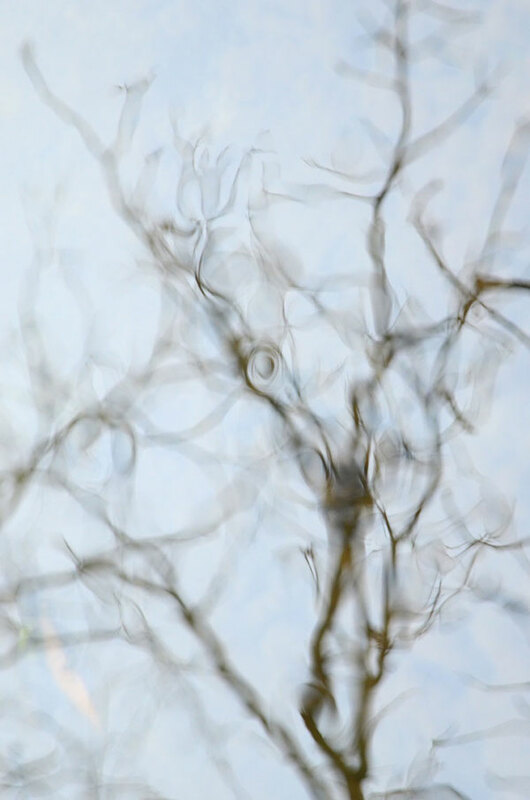 Anne, the images were originally tree branches reflected on gently moving water. Elena certainly worked some magic! Very nice. I enjoy doing this type of thing with space and cloud photographs too. It’s a great collaboration. Thanks, Michelle. Clouds would be inspiring for sure! what a beautiful collaboration! They fit perfectly together to create amazing dreamlike images! Thank you, Mimo. Elena transformed them beautifully! Beautiful and so surreal . i like the description of Elena weaving a story into mine – that’s perfect. Thank you! Excellent work by both of you!!!!! a dreamlike collaboration. so nice. I’m glad you think so, Virgilio. Thanks so much! What a powerful combination ! Thanks, yoshizen. I think it was a good match. Wonderful work, to both of you. Hi Adrian, thank you very much. Elena’s vision for these is perfect. Can’t add anything except another comment about how wonderful these images are!! Wonderful feeling to this Karen, love it! Thank you, Phil. Elena is responsible for the final ethereal images. Ohhhhhhh I am so thrilled with this… 2 of my favourite bloggers in collaboration and with such brilliant affect.. Bravo to Elena/Karen … and I love the generator.. what fun! Yes, that artist statement generator is kinda fun! I’m loving the final drawings myself! Collaboration is so cool, and what a gentle delicate touch you both have. thanks, Anne. It has been a joy collaborating with Elena. I was thrilled she was willing. An inspired collaboration. It is fascinating to see the chemistry of two artists at work. Wonderful idea and beautifully executed. Love the tension between the real and the imagined – a true collaboration. Thank you, Richard. I do love where Elena took this. Utterly beautiful, Karen! You inspire me to think outside of the box. Thanks, Millie! I’m quite sure you already think outside the box, you are wonderfully inspiring yourself. Elena worked beautifully into these, didn’t she? I was thrilled to see what developed. They are, aren’t they? Thank you, Steven. How did she digitally draw over your photographs.? Interesting . I saw these over on Elena’s blog. Absolutely exquisite work. You two should collaborate more often! love love love. i think you might have a book in the making here. Collaborate on! Thanks so much, Marina. It turned out wonderfully! Hi! Elena here. First I want to thank you all for your kind words. It was so much fun working with Karen. It was a gift. She’s wonderfully generous, and I’m a huge fan of her stunning work. Carla, you asked a great question. I worked in Photoshop. Specifically, Photoshop allows for multiple layers to draw on, so I did not have to disturb Karen’s image. I created a layer per color and figure, and literally drew with a stylus on a Wacom (digital) tablet. Photoshop also allows for varied opacity changes and offers all sorts of options. For this, I wanted to keep my work as simple as possible because the underlying images were already beautiful. Thanks, Scott – A happy collaboration! Fabulous collaboration by two very talented artists. Hi Simon, thank you. It was a really fun process and Elena’s work is amazing. Wow! 😀 This is like some magic! Elena did work some magic! Thanks, Nandini. I thought I’d left a comment on this post before Karen, but it seems not. I can’t really remember what I wrote then so I’ll just summarise. This.work.is.just.superb! Congratulations to the both of you.